Another episode opening, another view of the bejeweled Queen Victoria in a carriage. She's on her way to the State Opening of Parliament, and she's wearing her Uncle George's Diamond Diadem, plus a diamond necklace that is probably intended to be the production's version of Queen Charlotte's diamond necklace. 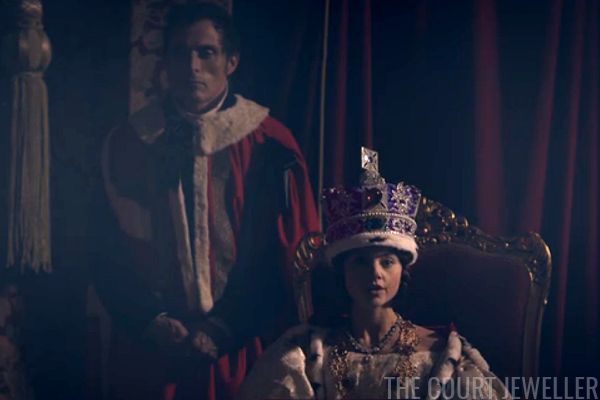 The next day, Victoria and Lord M view Queen Elizabeth I's accession portrait and chat about Victoria's problems. She's got 99 of them, and her uncles are basically all of them: Cumberland is still trying to convince everyone that she's mentally unfit to rule, and her mother's brother, King Leopold of Belgium, is heading to England now, too. 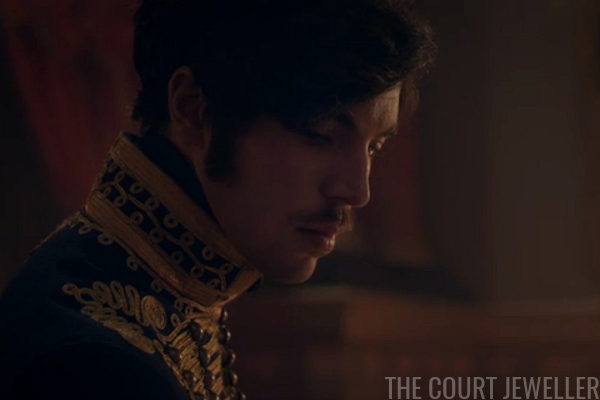 Leopold wants her to marry her cousin, Prince Albert. Victoria is not interested. 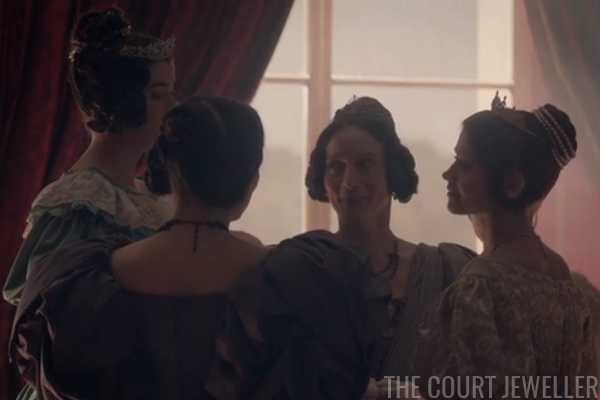 Victoria and her ladies wear daytime (maybe, benefit of the doubt, late afternoon?) tiaras as they wait for a special guest: King Leopold. 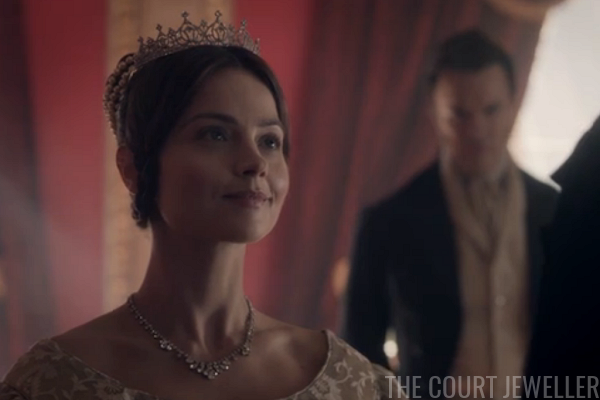 To welcome her uncle, Victoria's wearing the same little tiara (not a royal replica) that we've seen in previous scenes, plus a diamond necklace and a bunch of pearls in her hair. Does Uncle Leopold look familiar? Yep, that's Alex Jennings, who we recently saw playing the Duke of Windsor in The Crown. (He also played Prince Charles in The Queen.) He has basically cornered the market on playing meddling royal uncles. 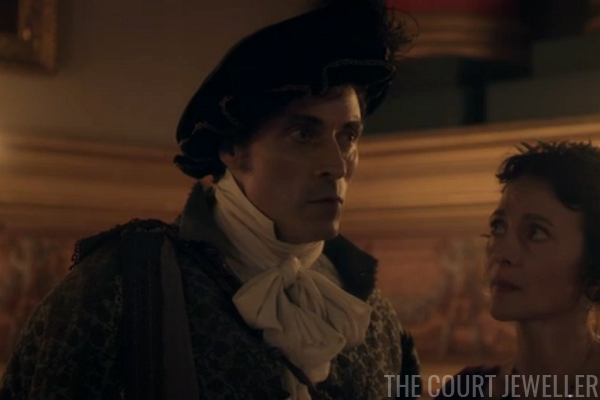 Immediately after he arrives, Leopold commits the cardinal sin of this television show: he calls Victoria short. Look out! 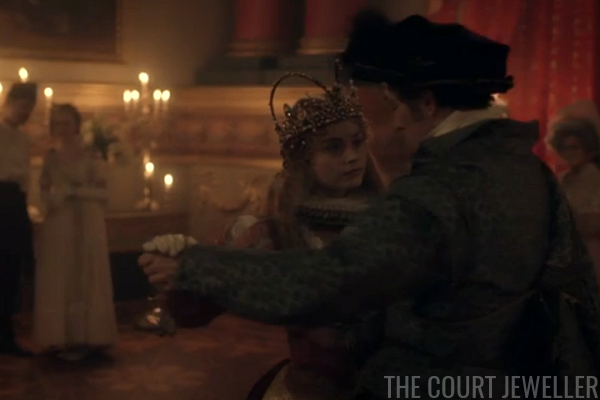 He also points out (correctly, but awkwardly) that if his first wife (Victoria's cousin, Princess Charlotte) and their child had lived, she would be Queen and he'd be the one living in the palace. 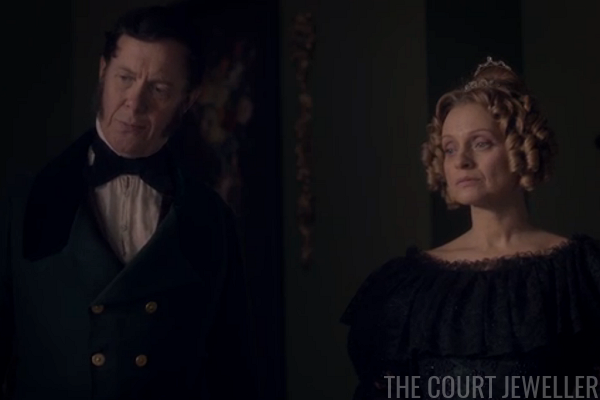 The Duchess of Kent greets her brother and immediately starts plotting about marrying off Victoria and their nephew, Albert. She's wearing her Queen of the Prom jewels from the Coronation Ball. Also scheming: the Cumberlands, naturally. (Who were off reigning in Hanover at this point, not giving a fig about much of this.) Still wish that Frederica, who is wearing rather modern pearls here, was narrating this show. 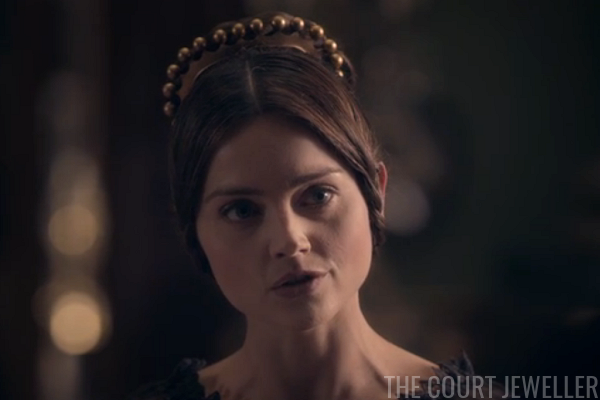 As Lord M explains why he thinks first cousins shouldn't marry, Victoria wears a VERY assertive, tiara-esque hair comb. 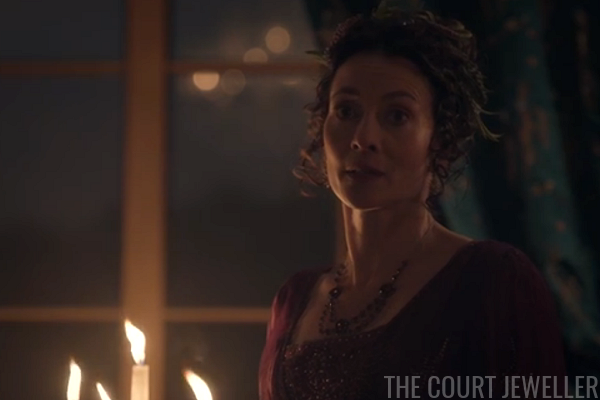 This sort of reminds me of a Tudor hood silhouette, which could be an interesting link to all of the Elizabethan referencing in this episode, I suppose? Here's one more look at the comb. Melbourne also fills Victoria in about the Chartists. This episode makes it seem like Victoria was personally involved with the government's decisions after the Newport Rising, which is not accurate. That evening, everyone goes to see Lucia di Lammermoor, which had debuted in London in 1838. (Conveniently, it's about a madwoman who has a not-so-great experience with marriage.) 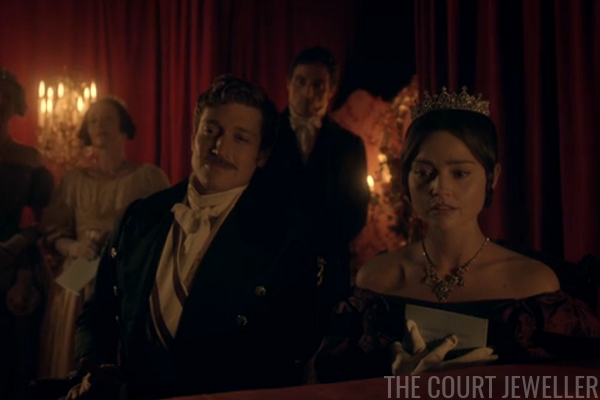 Victoria wears her tiara and necklace to sit with Grand Duke Alexander. The Cumberlands dispatch another royal cousin, Prince George of Cambridge, to go and try to woo Victoria. While he and the Grand Duke peacock in front of the Queen, Lord M and Lady Portman talk about Victoria's marriage prospects. 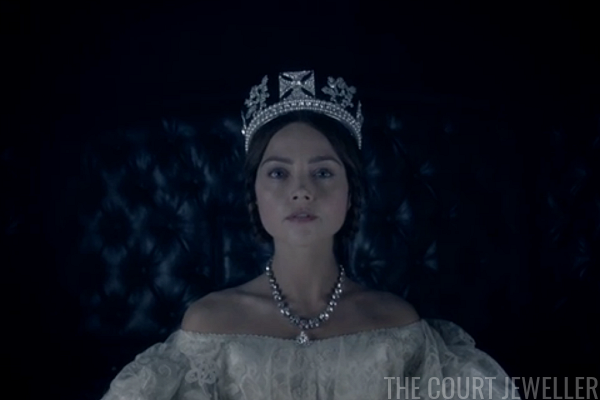 Emma's wearing her Coronation Ball tiara. 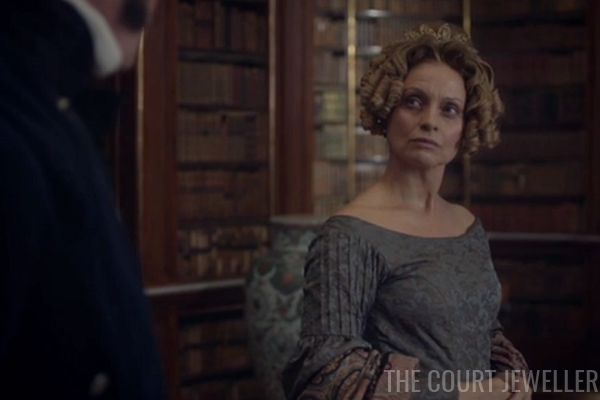 The Duchess of Kent asks Leopold for money, claiming that she's living like a pauper while wearing a tiara-esque hair comb and standing in a royal palace. Not great optics, Victoire. 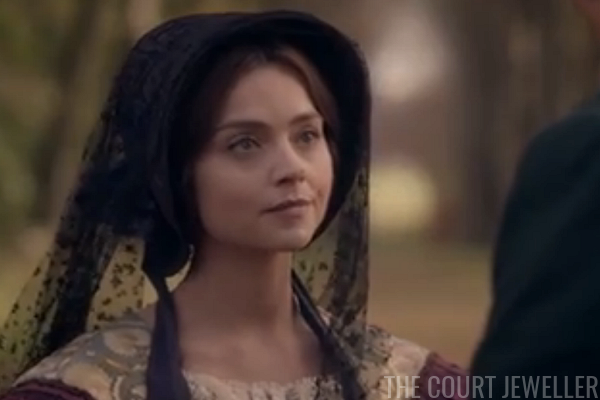 Victoria goes to unveil a memorial to her father, but the ceremony is interrupted by a Chartist protest. 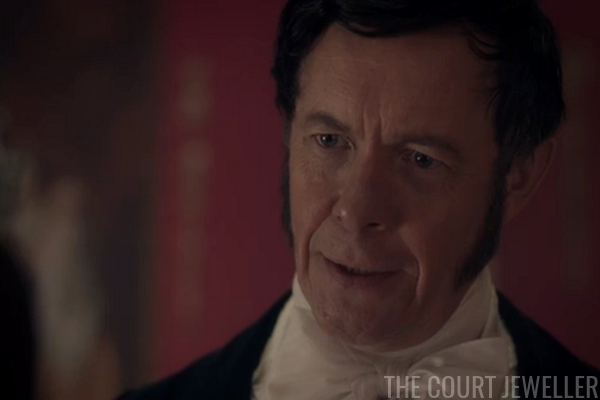 Victoria is escorted away, but Uncle Leopold decides this is the best moment to chat with Melbourne about Victoria's future husband. 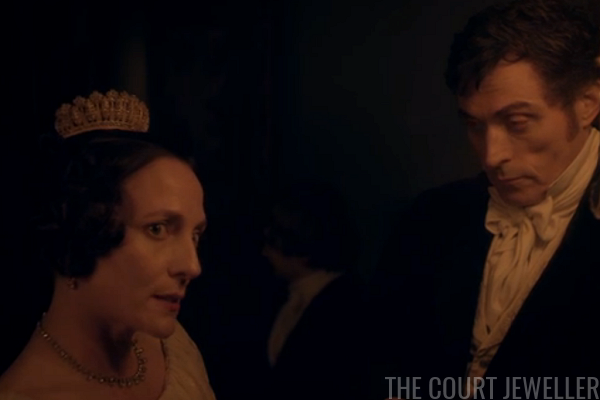 Leopold wants her to marry as quickly as possible; Melbourne thinks she should wait. 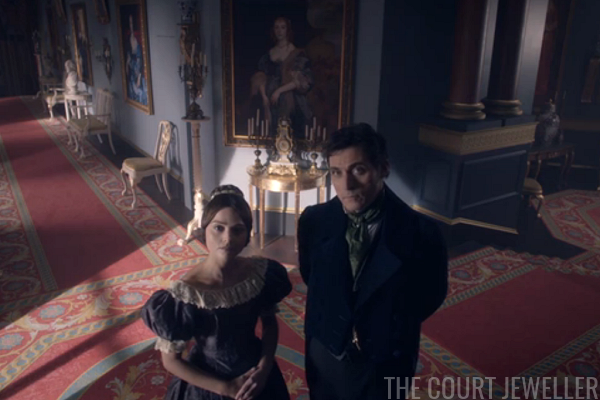 Victoria tracks down Lord M at his country estate, Brocket Hall, to basically tell him that she loves him. He lets her down as gently as he can. 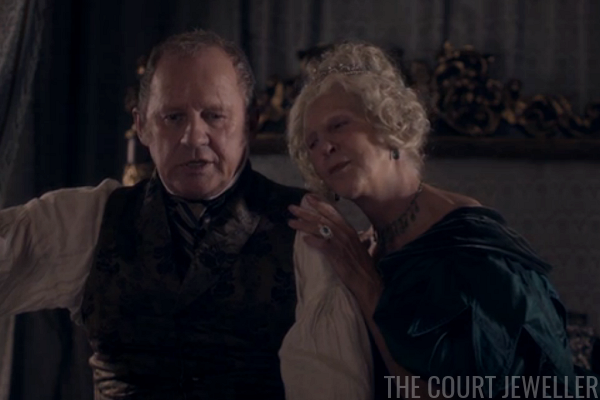 Victoria wallows in her sadness, but the Duchess of Kent and Uncle Leopold are still all over her about Albert's visit. 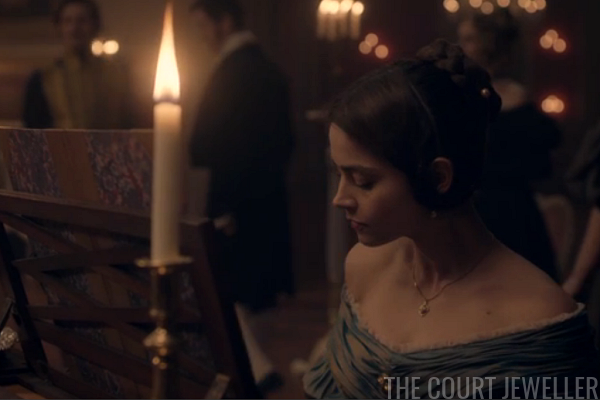 Victoire has really taken her hair jewelry to new heights in this scene. 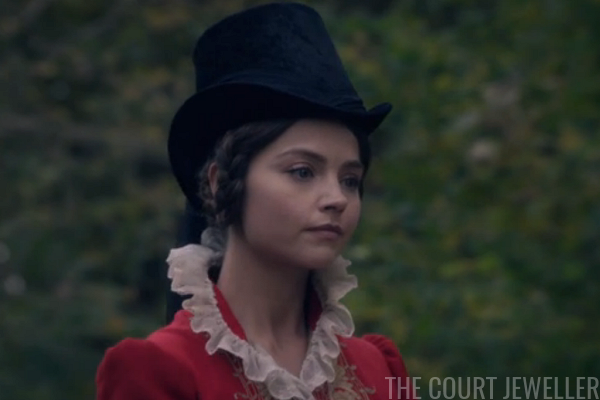 For the fancy dress ball being given in honor of Uncle Leopold, Victoria dresses up as -- you guessed it -- Queen Elizabeth. 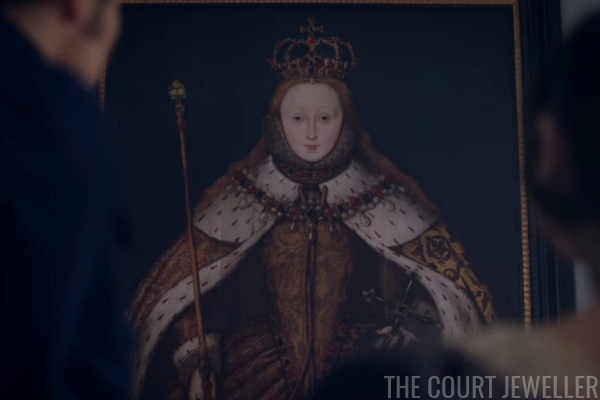 The outfit and jewels are based on the accession portrait shown earlier in the episode. 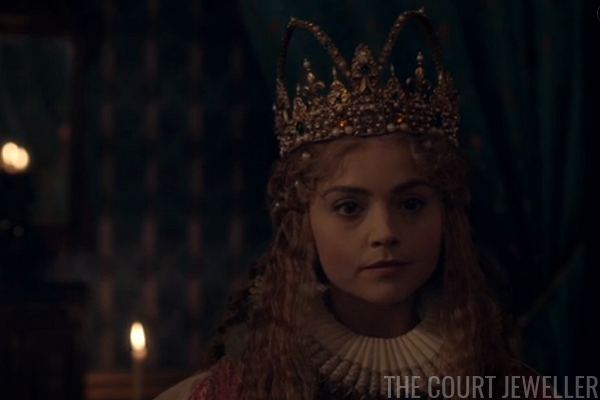 The crown's a little strange -- shades of Albania's goaty tiaras -- but it's supposed to be a costume, so I'll give it a pass. 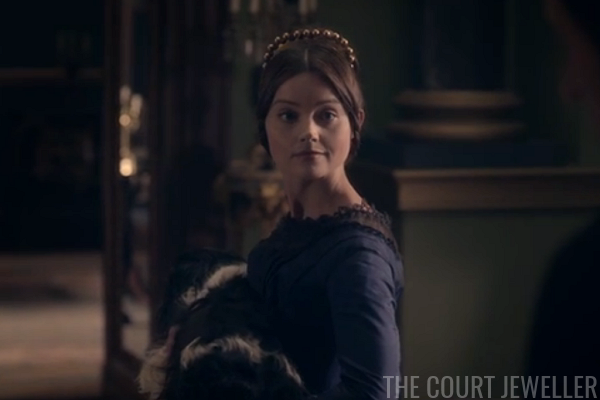 Lady Portman notices that Lord M has sent Victoria orchids from Brocket Hall and makes observations. 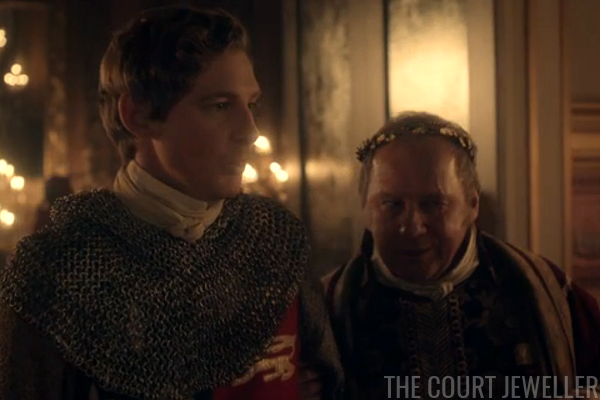 Lord M shows up dressed as the Earl of Leicester, one of Elizabeth I's paramours. Emma's face says what I feel: that's kind of a jerk move, Melbourne. Uncle Cumberland (in a hilariously small little "crown") and Cousin George Cambridge (as Lancelot, NOT Galahad) argue about George's wooing. 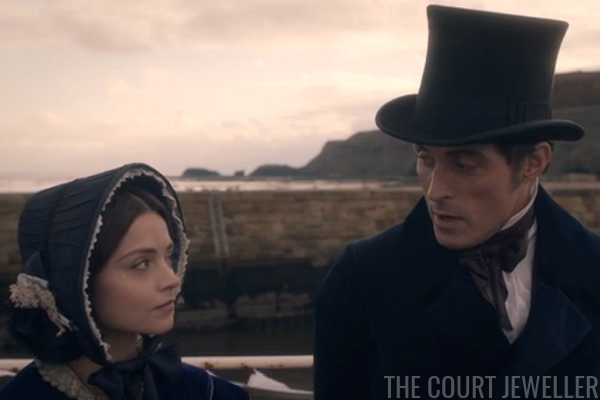 Victoria overhears him calling her short, which obviously seals his fate. In real life, George ended up marrying an actress, Sarah Fairbrother. Lord M and Victoria waltz wistfully, talking about the orchids. 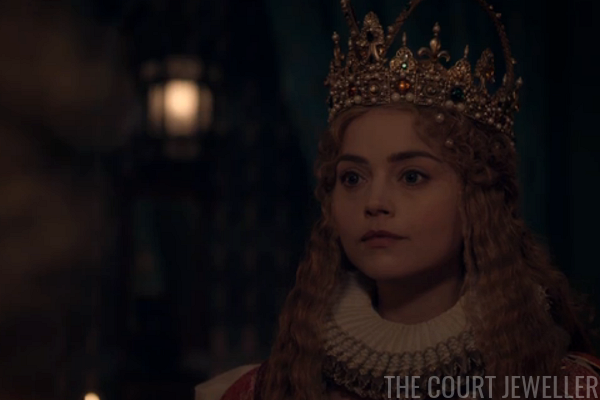 There's a lot of back and forth about Elizabeth and Leicester and marriage, of course. Grand Duke Alexander heads back to Russia, where he will marry a German princess and eventually become the tsar. 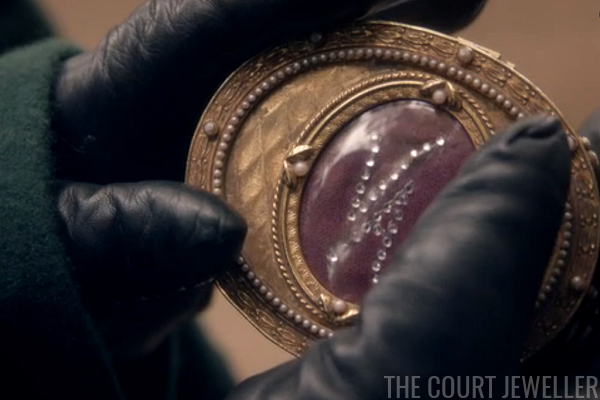 Before he leaves, he offers Victoria a little parting gift: a box with their initials, VA, set in the lid. (Ha.) 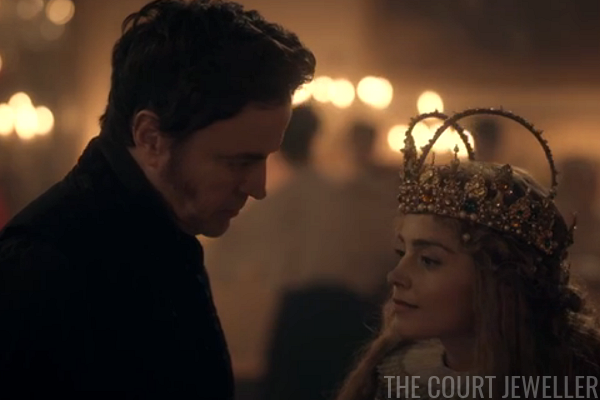 Alexander and Victoria would cross paths again: their children, Alfred and Maria, eventually married. The Cumberlands schemes have been foiled again! But never fear: Frederica (looking very much like Bette Midler in Hocus Pocus here) consoles her husband by reminding him that women die in childbirth all the time. Lovely. They finally decide to decamp to Hanover, which they did much earlier in real life. Victoria asks Melbourne to commute the sentences of the Chartists from the Newport Rising. Their sentences were commuted in real life, but Victoria apparently played no part in it. 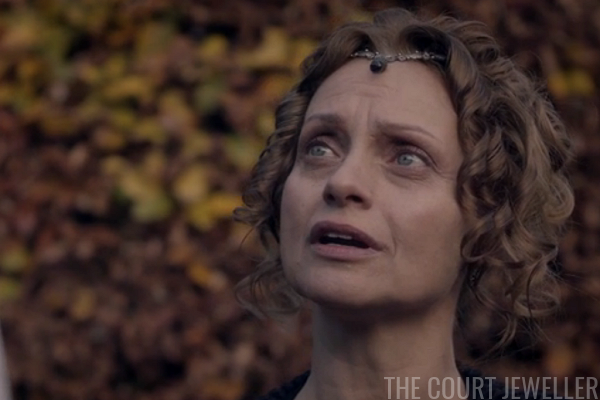 The Duchess of Kent wears forehead jewelry as she discovers that Conroy has agreed to leave. 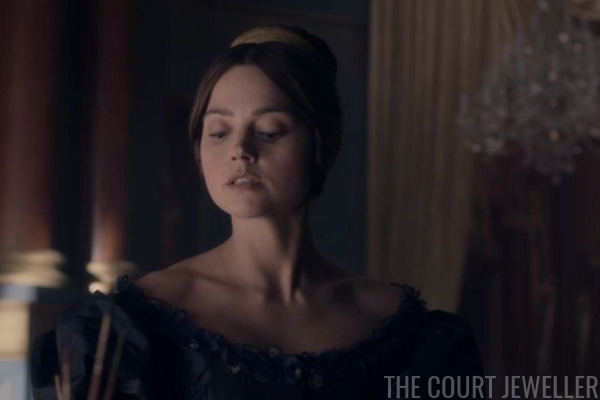 Victoria wears another hair comb as she copies the portrait of Queen Elizabeth. Melbourne hangs out nearby and tells her that the Coburg brothers are due to arrive any day. (In real life, Albert and Ernst showed up in October 1839.) 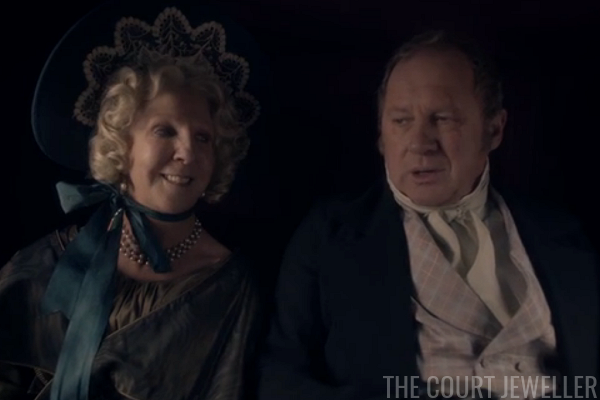 Lord M has changed his tune: he thinks it would be better if Victoria did marry Albert after all. Albert, of course. 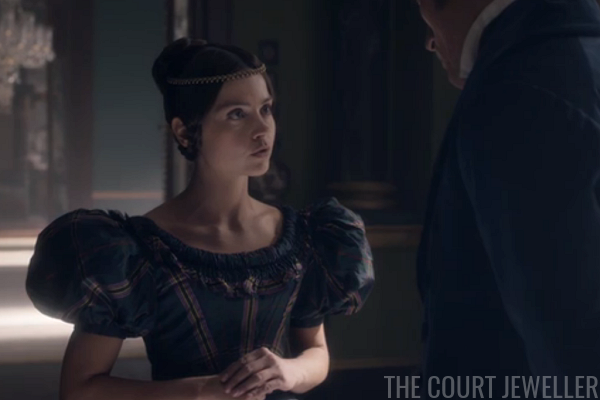 The scene was directed very dramatically, which was effective for TV -- maybe a little more than their real meeting in October 1839, which took place on a staircase at Windsor Castle. Albert was still seasick from the trip across the channel. Romantic! 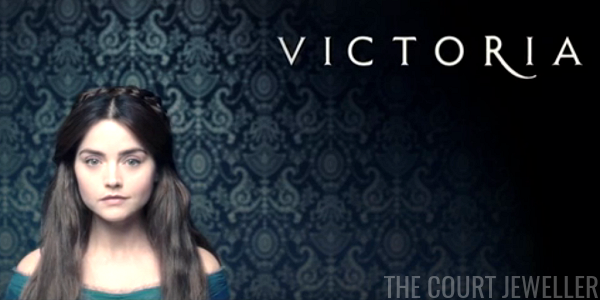 Stay tuned next week for another bejeweled recap of Victoria!